Mushrooms for cancer? Mushrooms having stunning powers to help prevent and fight breast cancer and other types of cancer. See what types of mushrooms you should be eating including a delicious, plant-based recipe for mushroom soup. The ancient Egyptians believed eating mushrooms brought long life. While their scientific method was not entirely sound by modern standards, scientists today are investigating the medicinal properties of mushrooms and beginning to see fascinating results. The scientists reviewed the women’s eating habits, and factored out other variables that contribute to cancer, such as being overweight, lack of exercise, and smoking. And they came to a startling finding about mushrooms. Women who consumed at least a third of an ounce of fresh mushrooms every day (about one mushroom per day) were 64% less likely to develop breast cancer. In the study, dried mushrooms had a slightly less protective effect, reducing the risk by around half. Even more impressive, women who combined eating mushrooms with regular consumption of green tea saw an even greater benefit — they reduced their breast cancer risk by an astounding89%. Why Do Mushrooms Fight Cancer? Mushrooms are thought to protect against breast and other hormone-related cancers particularly because they inhibit an enzyme called aromatase, which produces estrogen. Mushrooms are one of the very few foods that inhibit aromatase (pomegranate is another). And several varieties of mushrooms, including the commonly eaten white button and portobello mushrooms, have strong anti-aromatase activity. But consumption of mushrooms protects against more than hormone-dependent cancers. Mushrooms also contain specialized lectins that recognize cancer cells and have been found to prevent cancer cells from growing and dividing. 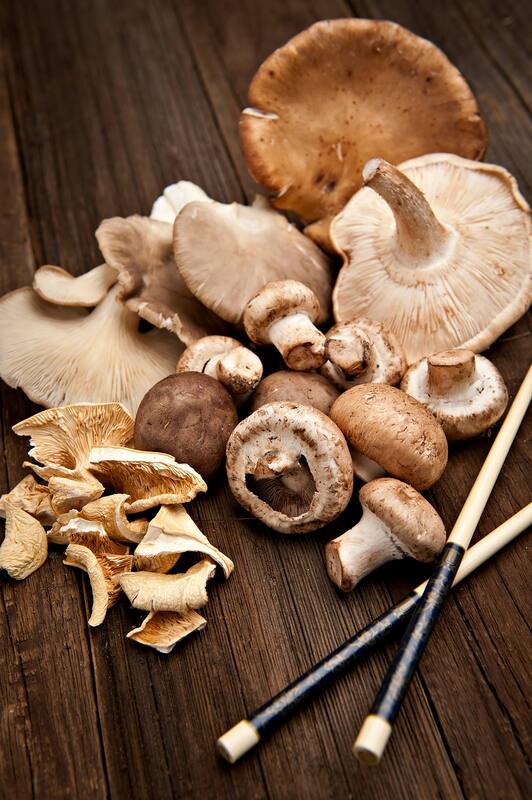 Which Mushrooms Are Best to Prevent Cancer? Thousands of kinds of mushrooms exist, and our understanding of their cancer-fighting and health-promoting properties is growing rapidly — but it’s still in its infancy. In addition to button mushrooms, white, crimini, shitake, oyster, portabella, maitake, turkey tail, and reishi mushrooms all contain bioactive compounds with the potential for potent anti-cancer activity. These mushroom phytochemicals have anti-angiogenic, anti-proliferative, and other anti-cancer effects, which have been studied so far in relation to stomach, colorectal, breast, and prostate cancers. As it turns out, white button mushrooms or big white mushrooms (stuffing mushrooms) are best for breast cancer prevention. So eating white mushrooms daily can be a significant step you can take to avoid breast cancer. Mushrooms bring special flavor and texture and are able to enhance a wide variety of dishes. They work well in combination with most food groups. But they are best enjoyed cooked (never raw to avoid toxins), and as close to daily as possible. And of course, never pick wild mushrooms unless you are certain they are edible. 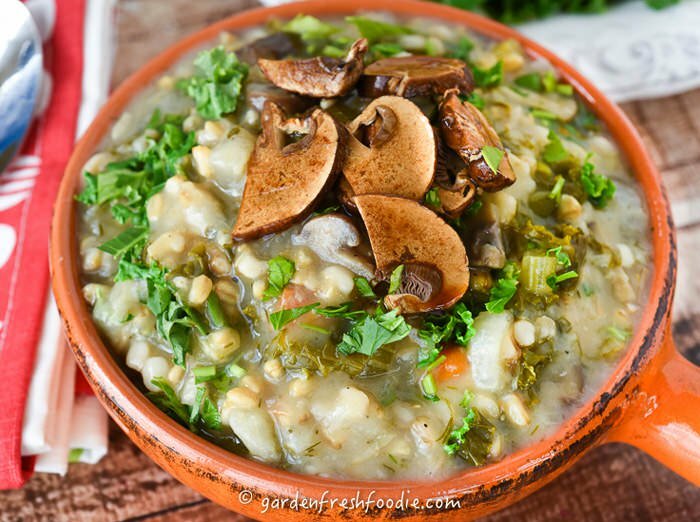 You can try this plant-based mushroom soup recipe from one of our recipe bloggers Jessica Meyers of Garden Fresh Foodie. Saute’ onions, until translucent in a hot pot with a little additional water to prevent sticking. Add in carrots, celery, and mushroom, and sauté for about 3 minutes, until slightly softened. Add in groats/barley, herbs, salt/pepper, bay leaves, & water. Bring to a boil and reduce to simmer. Cook for about 1 hour. Add in cabbage, and continue to cook until oats have completely swollen and are nice and chewy, about another 1/2-1 hour. Stir in fresh lemon juice, greens, and parsley right before serving. Season with additional salt/pepper. This soup goes well served with a fresh salad. Barley contains gluten, so to make this recipe gluten free, use gluten-free oat groats. • Packed with fibre; AWESOME for reducing LDL cholesterol (the bad kind), improving digestion, lowering blood sugars, and making you feel satiated. • Good source of Vitamin C; 33% daily needs; antioxidant which helps to boost immunity and lower inflammation in the body. • Great source of Vitamin A: 97% daily needs/serving-great for reducing inflammation, detoxifying the body, improving skin, nail, eye, and hair health. • Great source of potassium: 530 mg potassium; important for kidney and nervous function, as well as lowering heart rate and blood pressure. • Good source of plant-based iron (better absorbed by the body) 13% daily needs, important for oxygenation of the blood. • Source of plant-based calcium (better absorbed by the body) 7% daily needs, needed for bone and dental health. This blog is based on an article from The Food Revolution Network.